The Conservative Party was fined $52,000 for breaking election rules in a deal that saw charges dropped against four senior officials, but guilty pleas by the organizations for which they made the decisions. Under a deal accepted by Judge Celynne Dorval in an Ottawa courtroom Thursday afternoon, the party and its fundraising arm, the Conservative Fund, pleaded guilty to Elections Act charges of incurring election expenses exceeding the maximum allowable and filing election records that didn't set out all expenses. More serious charges against the party and its fundraising arm of wilfully breaking the laws were withdrawn. Charges against Senator Doug Finley, the party's former campaign director, and Senator Irving Gerstein, head of the Conservative Fund and chief fundraiser for the party, were withdrawn, as well as charges against Michael Donison, the former national party director, and Susan Kehoe, who served as the party's interim executive director. The prosecutor told the judge the new charges were still serious and asked for the maximum penalty of a $50,000 fine to the party — $25,000 per charge — and $2,000 to the Fund, $1,000 per charge. The judge agreed, saying the offences were "of a regulatory nature but significant to the democratic process," and accepted a defence request for 30 days to pay. 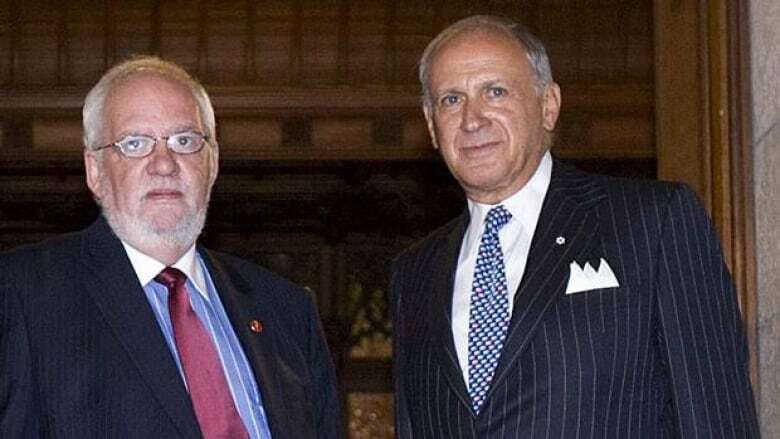 The charges were laid under the Canada Elections Act in February relating to the so-called "in-and-out" campaign financing case stemming from the 2006 election. The charges were not criminal. None of the four Conservative officials were in court Thursday; and were instead represented in the court by their lawyers. The defence and prosecution agreed that party officials knew before the 2005-06 election campaign started that they would come close to their limit and that they had extra money to spend. "Finley wrote to Gerstein and asked him for authorization to send monies to electoral district associations so Finley could have them 'return monies to me under their writ to pay for advertising for example', through what Finley called 'a variety of perfectly legal artifices,'" says the agreed statement of facts. "Finley explained to Gerstein that this would allow the party to 'pay for advertising for example' and 'run a major slam dunk in the extra two campaign weeks' over its competitors." By Dec. 9, 2005, Retail Media Inc. (RMI) ad agency, which booked ads for the party, transferred already booked national ads to local campaigns. Defence lawyer Mark Sandler told the judge Thursday none of the parties deliberately broke the Elections Act rules, calling it "limited non-compliance." The party had legal advice that said transfers could be made to the candidates and back if the regional ads displayed a note saying they were "authorized by official agents" for the candidates. Gerstein said the plan should "comport to all legal requirements," according to the agreed statement of facts. In accepting the plea, Dorval noted the refunds to the candidates are paid out of public funds. "Courts must show concern when offences are committed against rules which are meant essentially to ensure fairness in the electoral process." Elections Canada alleged those transfers broke election spending rules, by allowing the party to improperly report $1.3 million in national advertising as expenses incurred by local candidates. The elections agency said the transfers allowed the party to surpass the maximum spending allowance and for candidates to claim rebates on expenses that weren't actually incurred. The Conservatives argued they followed the election financing rules that were in place in 2006 and that Elections Canada later changed its interpretation of the rules. In addition to a charge that the election spending limit of $18 million was exceeded, Gerstein faced a charge of providing Elections Canada with a return that he knew or ought to have known contained a false or misleading statement, namely that all elections expenses had been properly recorded. The guilty pleas came under different sub-sections of the Canada Elections Act than the original charges. The Conservative Party claimed victory after Thursday's proceedings. "This is a big victory for the Conservative Party of Canada," Fred DeLorey, the party's director of communications, said in a written statement. "Every single Conservative accused of wrongdoing has been cleared today." "The Regional Media Buy was always intended to comply with the Elections Act. After five years the other side has finally determined that they could not or should not prove otherwise." Richard Roy, the prosecutor in the case, said the party and the fund pleaded guilty to not properly representing their election spending. He said the evidence proves the spending wasn't an accident. "The judgment and the agreed statement of facts show that it was an infraction. That they pleaded guilty to the infraction, that's the demonstration that was illegal," he told reporters outside the courthouse. Thursday's court proceedings are part of a lengthy legal battle between Elections Canada and the Conservatives over how election expenses are claimed and reimbursements issued. Last month, the Supreme Court decided it would hear the Conservatives' appeal of a lower court ruling against them over election spending reimbursements. The Federal Court of Appeal had ruled Elections Canada was right to deny reimbursements to former candidates for the in-and-out ad spending.